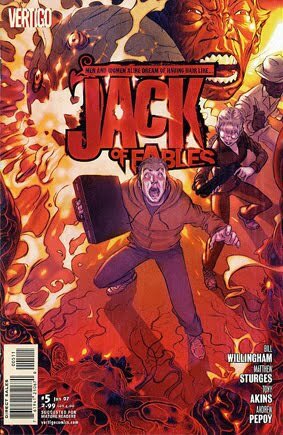 • JACK OF FABLES #5 "Jack, Off"
• PLOT SUMMARY: Captive Fables, divided into dozens of four-man escape teams, have scattered to the four winds, throwing the evil librarians of the Golden Boughs Retirement Village into chaos. But before Jack can lead his escape team to safety he first has to defeat the perusing Bagmen in single, unarmed combat. Here's the problem though: No one has ever defeated a Bagman in single unarmed combat!